The Zeros caught my eye early, their „Hungry/Radio Fun“ 7″ on Small Wonder Records made it as early as 1980 into my collection. Only later i realized that since 1976 there was another band from sunny California respectively Chula Vista with the same name and an ever better sound. Since then and because their output was a mere 3 singles until 1980 i was eager to get more. It took until 1990 that Greg Sage released a compilation on Bomp! that provided the full spread of their early output. How cool and how ahead of times these Mexican Ramones (an early odd label tucked upon them) actually were is frame up in this 1977 TV Show – by all means they should have been as great as the Ramones! 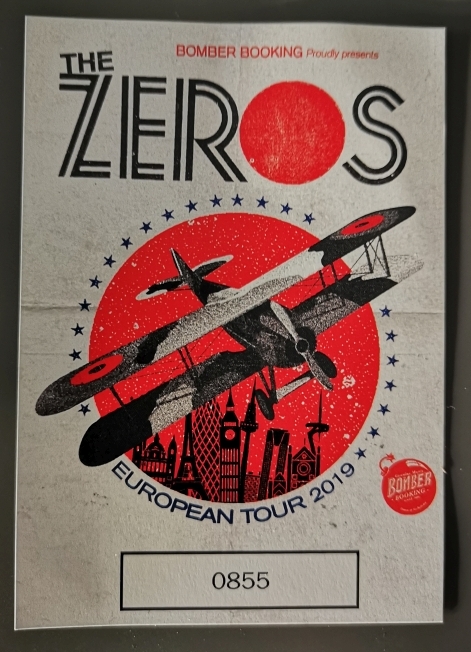 Fast forward to 2019 and The Zeros are back to Germany, only ever the 2nd time to Hamburg. As far as i could make out (and got rumors) their tour was plagued. Some whisper i heard referred to annoying promotion, some whispers referred to a tough geographical schedule zigzagging across northern Europe. When it came out that they will play Hamburg i sure got a ticket but noticing the date i feared the worst: A lonely early March, under the week on a Wednesday. Consequently they had to play the Pub Stage of the Monkeys and it ended up to be in front of 21 people. From the start i felt damn sorry for the guys as they shared much larger bills in the past (and did play with all my all-time favorites from LA – be it The Germs, The Weirdos and and and). But that remains the fate of touring bands when timing is just not right. These days The Zeros lack El Vez but still got style, presence and mu-sick-al capabilities. And professional as they are they are just not impacted by a small stage and a small turnout. And boy, that guitar is still there and still provides a driving wall of sound! They paired old and classic songs with some later and more 60s rock based songs and they sure did throw in some classic covers, eg. from The Stendells (who are that link back to the 60s by all means). It definitely was fun for the few in attendance and even some dancing took place. Also some chit-chat between the audience and the band so that the depressing small turnout for such a classic and funding punk band could not bring down the mood. I was sold on The Zeros prior and this one just cemented it: Great and friendly people with a great sound and sufficiently great songs. And humble and hard working. That is more than some of the other old bands on the circuit give. I’d love to see them back, on a warm summer Friday in a packed club with a fitting support band. That’ll be the right way to credit one of the pioneers of West Coast Punk and in general of this funny mu-sick-al niche that i love. Fun fact: That the promotion was a wee bit strange also manifested itself in the fact that tickets where only available on the website of the promoter and by knowing a wee bit of Spanish. And on the evening tour tickets where sold. I guess the guy is a control freak, or? nb: At least i deduct from that ticket sold in Hamburg that the prior shows (Paris, London, Leeds, Nottingham and Brighton had on average 170+ people attending) went better. They deserve it. 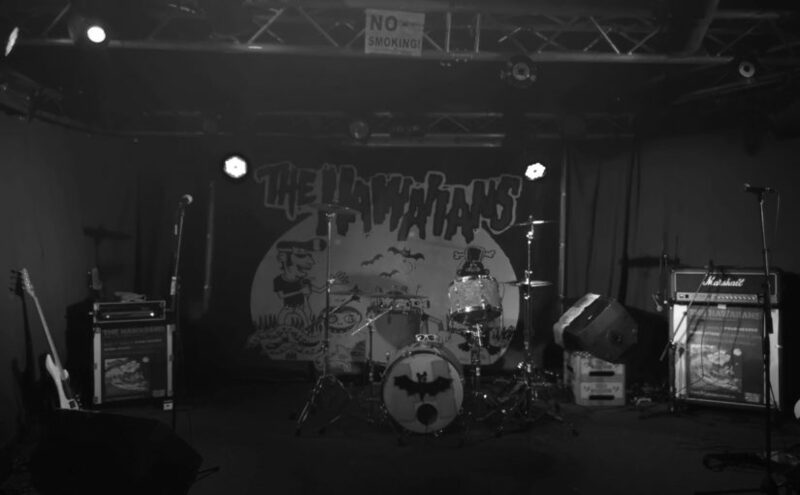 nbb: Looking at the pictures i would propose that the Monkeys invests into a backdrop for the Pub Stage – that would make bands look much better (if i may note that as a humble consumer). … only the 4th birthday? Only 4 years? For many the Monkeys is like a 2nd home and for many it feels like the club has been around „forever“. True is that it opened doors in February 2015 (with an „inoffical“ show and a fun wrong print on the hardticket) and thus indeed it was time for the 4th birthday. So congrats Sam & Ralf! The rooster was diverse (and unpretentious) as the club itself. 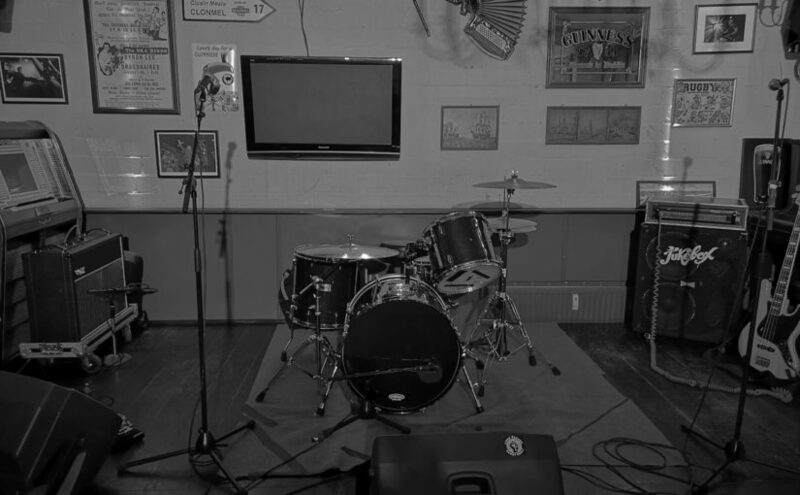 Kick off was with some bubblegum ramonescore from Westerkappeln (a town with indeed a funny name). Three guys, three Hawaii shirts and three sunglasses – and off it took. That said i did like their bubblegum sound, their stage attire (always important to me) and their short set. At the height of that they actually managed to get some Travoltas-like multi voice choruses going, something that i damn like! And with a swift makeover of the stage it was time for a world premiere: For quite some time some of the Hamburg lot come together in the Monkeys to sing together. 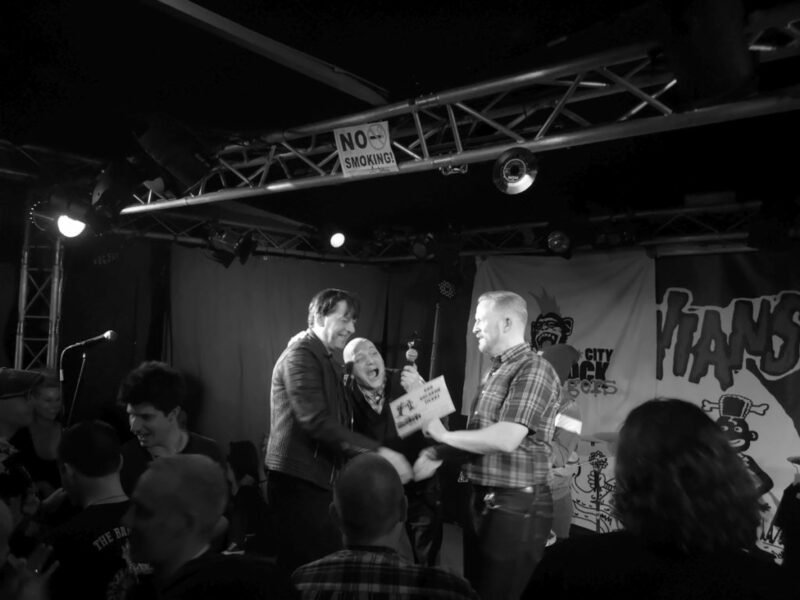 What at first was dubbed as Monkeys Choir now is called Hamburg City Punkrock Singers and is a 20+ folks venture. 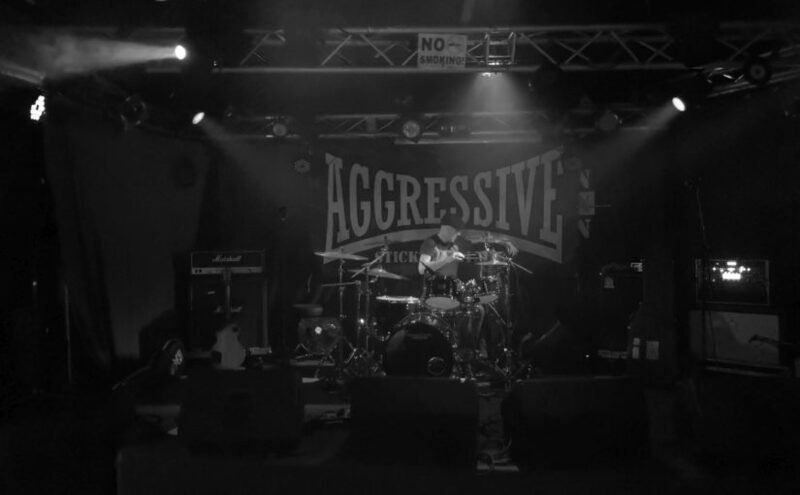 At first it felt funny, as in front of the stage it was a wee bit empty and that feeling was odd: Those normally standing next to me to see bands all stood up there on stage! Next to vocals they also had Hauke on a guitar to provide a bit of rhythm and by that means hold the voices together (though sometimes being too loud and too off). Did it work? I have to admit that it worked only partially but as they are into it very fresh there is ample time and space for improvement. On some songs it went remarkably well, specifically when the song did lend itself to vocalization (and some challenge response singing was added). On other damn simply the full frontal singing may work eg. in a football stadium but it ain’t in the choir setting on stage. But full credit for their effort and indeed i look forward how that venture evolves as the idea is a great idea! Next chance to see them is open air on the Jolly Roger stage of the Hafengeburtstag – don’t miss it! 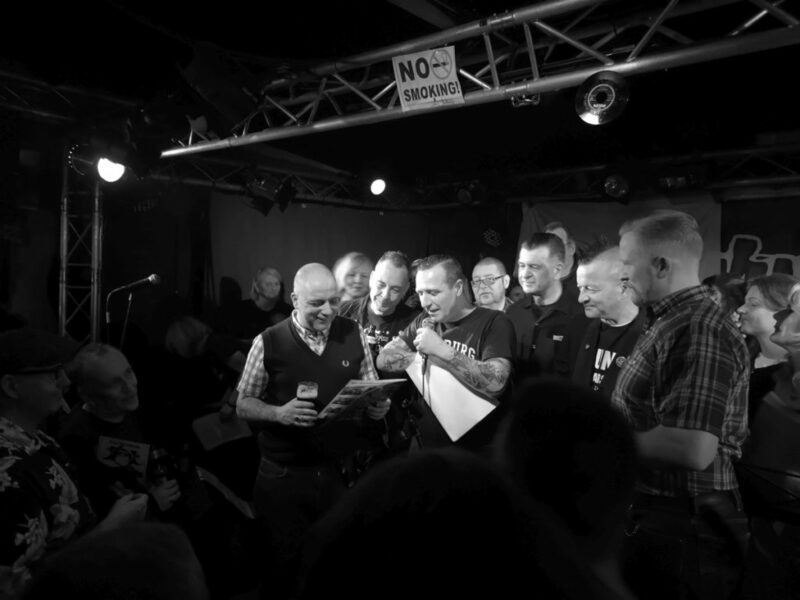 And once the choir had finished it was time for some surprise for Sam and Ralf: Instigated by Arne some of the regulars did collect some funds for the club to allow them to address needs outside the regular investment schedule. With some loud cheers they where handed over (only to be proposed by Ralf to be spend on a pub crawl with all the bar, stage and sound hands of the Monkeys). Next on the eagerly awaited lottery – the big prize of a Golden Ticket (with 365 days of free entry to shows) was to be drawn (and the lottery tickets sold provided 525€ for a local charity. After some fun about the minor wins the Golden Ticket found home with a regular – well done! In the aftermath of that lottery Sam announced 15 minutes of free beer for everyone and thus lured all of the audience to the bar and into the pub. 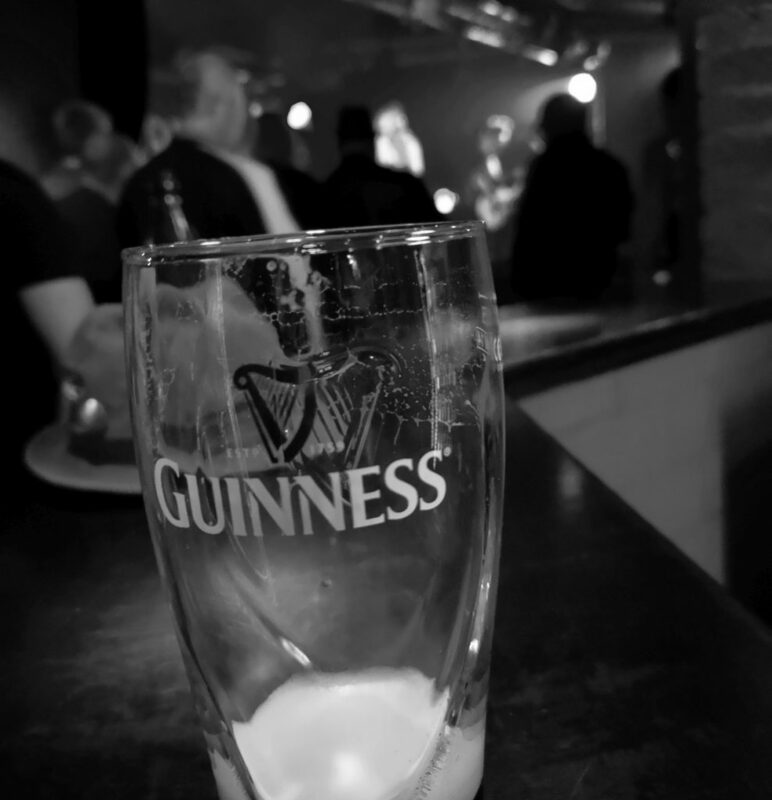 And whilst everybody rushed to drink Faz Waltz took the stage and started to play – obviously nobody told them to hold back a wee bit until everybody was satisfied with beer. But luckily their stone cold glam rock finally did lure people back to the stage and into dancing. Where Guida top their glam rock with some sugar it is Faz Waltz who deconstruct it more to the bare rocking bone and take it down the harder route. It is retro for sure but it is delivered very very well. 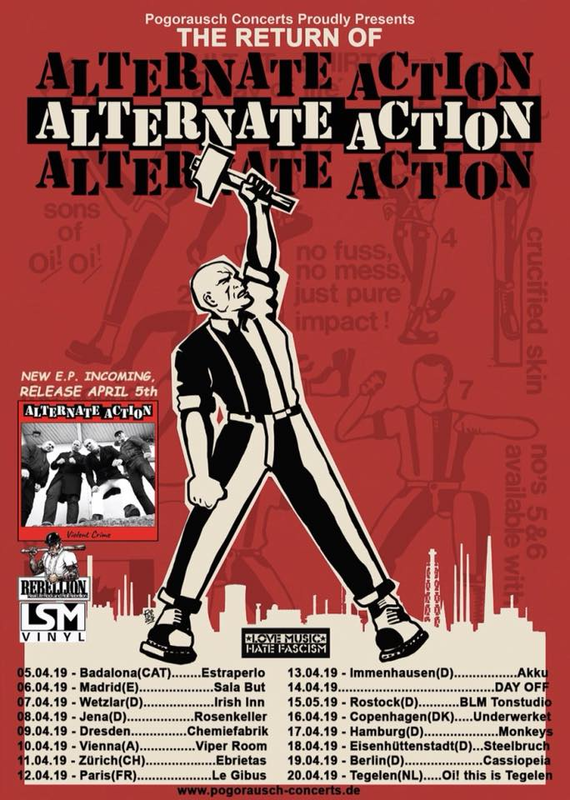 And it does not matter if you are into old punk or into Oi! – they carry all of these roots with them and give it back to you. In the end a lot of dancing came about and a lot of smiling faces enjoyed Faz Waltz. It was not sold out but the Monkeys was well filled (and those filling it took good use of the liquid supplies). Thanks Monkeys and thanks to all who make the Monkeys happen – may you stay afloat for many many years to come. A great rooster of shows is about to happen for 2019, i’ll sure be there. 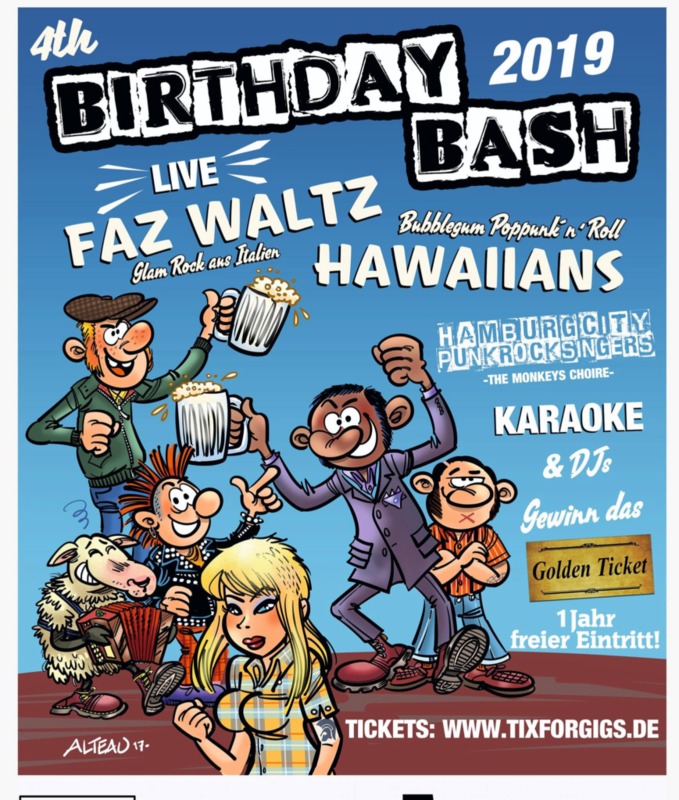 Format KurzmitteilungVeröffentlicht am 2019/03/08 Kategorien ShowsSchlagwörter Faz Waltz, Hamburg City Punkrock Singers, Monkeys Choir, Monkeys Music Club, The HawaiiansSchreibe einen Kommentar zu … only the 4th birthday?